Being a one car family back at home sometimes involves a bit of planning ahead and juggling to make it work, but we like it just fine. A car is such a huge expense, and we’d much rather put money towards our house, savings, or experiences than have to budget for a second car. Although we take the bus occasionally, it’s arguably much easier to use the car when we have children who are 3 and 4 years old. And there is always the unpredictability of weather conditions for the days we plan to bus. We end up using the transit more in the summer months since it gets harder as the snow flies! Typically we’ll use the bus when we both need the car, but we try to organize our schedule to share the car throughout the week. 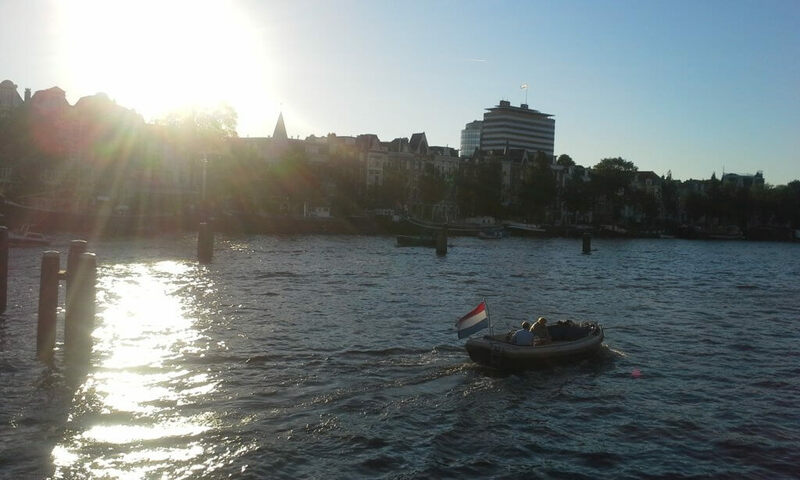 However, while we’re living in Amsterdam for a few weeks we don’t have a car at all. The transit is very good here and we decided to try going without a car and see how we manage. 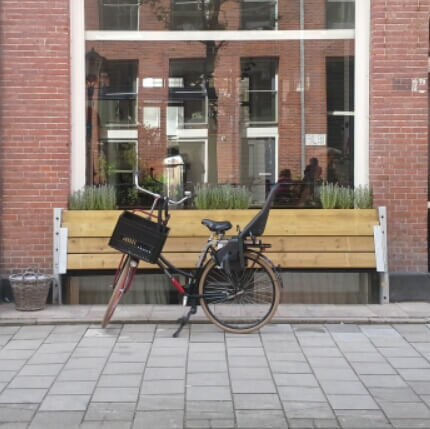 Amsterdam is built for biking everywhere – and I mean everywhere. The streets have biking lanes and so many people commute this way. We also saw many families biking together. Even people with young kids are able to add children’s seats to the front and back of the bikes. The city has a network of bike paths and a fairly flat landscape. Amsterdam has a population of about 780,000 people and it’s estimated that there are over 800,000 bikes; there are more bikes than people here! Because of all this, the city is known as one of the most cycle-friendly cities in the world. 63% of Amsterdammers use their bike on a daily basis. There are over 500 km of bike paths. There are over 900km of road with 30 km/ph zone. There are several grocery stores within walking distance of our apartment. There’s also a large outdoor market about a 15 minute walk away. The girls and I have walked there several times and found fresh fruits, fresh meat, as well as bakeries with lots of fresh bread and delicious pastries. We’ve done grocery shopping more often than we would back home since we need to carry everything home. But it’s made meal prep and meal planning easy, and we try to use up everything in the fridge before buying more. Our regular rountine with the car in Ontario involves my husband taking the car to work most days, and I can get to the school, shopping, and many parks on foot. We spend a lot of time at local parks and trails, and we did a similar thing here. The girls and I have gone exploring for local parks and found many play structures, swings, and parks where they can run. There are beautiful public parks alongside the canals and throughout the city. There were 2 days when we bought fairly pricey passes which include train, bus, and tram in order to travel farther out of the city. This was definitely worth it, and allowed us to see a bit more of the Netherlands while we’re visiting. Aside from these two days, we were able to walk or take a quick tram to see different locations in the picturesque city of Amsterdam. One Saturday we walked 20 minutes to find the Van Gogh museum. We also bused downtown several times to discover a flower market, medieval courtyard, and see the sights in the centre square. I think it’s safe to say that we’ll all be pretty happy to get back to our car when we arrive home. But like other experiences of living with less, there’s an element of freedom found when we let go of something that we think is a necessity. It’s freeing to discover how we can let go of things and still be happy, and how it’s possible to make do with less. This has been a simple adventure in itself: to challenge ourselves to live differently and see how life changes when a bike becomes the family vehicle. Minimalism isn’t about removing everything from our lives… it’s being intentional about what we allow in. If you think you’re becoming too attached to something, it’s a helpful practice to remove it for a while and see what happens. Perhaps you’ll see that you’re better off without, and then decide to remove it completely. Or maybe this experiment will simply allow the perspective to see how it’s beneficial, how it brings us joy, and how it makes life easier. And on the other hand, how it weighs us down, and how we’ve become unnecessarily dependant on it. When we remove something for a set amount of time, it allows us to clearly separate the words ‘need’ and ‘want’. Then if we choose to add it back in, it will hopefully be with intention, clarity, and the knowledge that ultimately stuff can’t make us happy. Let’s strive to have less stuff and more life on this road we travel.